Ultra-Cool? Or Weird and Ugly? Comme des Garcons' new collaboration with Nike. We know you're greasing your arms and sharpening your claws in preparation for Comme des Garçons' upcoming line for H&M, but in the meantime, take a peek at Comme des Garçons' recent collaboration with Nike, courtesy of Sneaker Files. 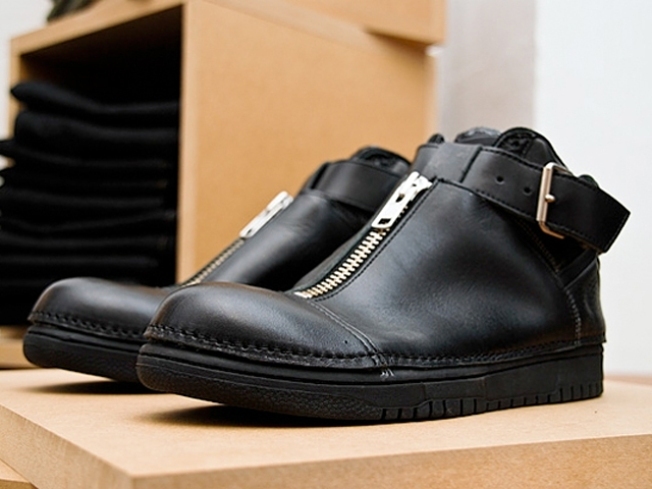 This biker-inspired zipper-and-buckle Doc Martens-looking shoe are, apparently, their rendition of the iconic Nike Dunk High (a classic! )—though we have to say we're not entirely seeing the resemblance. All that said, it is a pretty cool looking shoe, and will fit right in with all our new '90s-inspired wear for fall. Thoughts? Chances are, we'll stick with the original, or perhaps one of Nike's new iterations of another classic: The Court Force. For those with an aversion with the '90s punk grunge look, these are straight-up '80s hip-hop-inspired, rendered in colors that you could probably see from space. First dibs on neon-and-black patent!